Municipality finance directors in Cuyahoga County can now apply for Retrofits for ENergy Efficiency Works (RENEW). 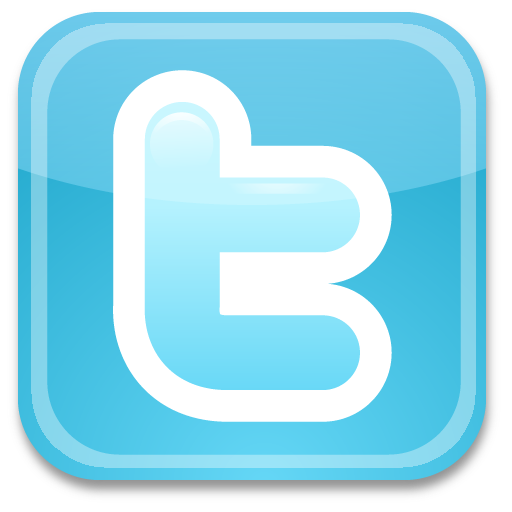 RENEW provides 100% high-road financing and technical assistance solutions for energy efficiency in municipal buildings. Over $25 million in energy conservation projects has been identified for over 50 municipalities by Cuyahoga County's Planning Commission, Emerald Cities Cleveland, the Cleveland-Cuyahoga County Port Authority, and Public Finance & Energy Advisors. RENEW requires no out of pocket cost for municipalities, offers financing that does not affect municipalities' debt limitations, and supports third-party monitoring and verification and contractor performance insurance. It is also a great opportunity to create jobs for disadvantaged residents and businesses across Cuyahoga County. Get started at www.renewretrofits.com. 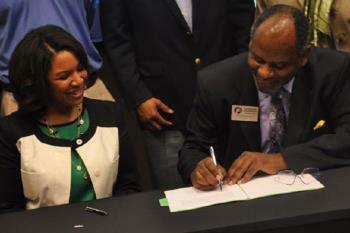 EC Atlanta Local Director Antiqua Cleggett and GPTC President Dr. Jabari Simama sign the agreement. NAMC President Gloria Shealey, NAMC Oregon Chapter President Maurice Rahming, and ECC President Denise Fairchild at the conference. 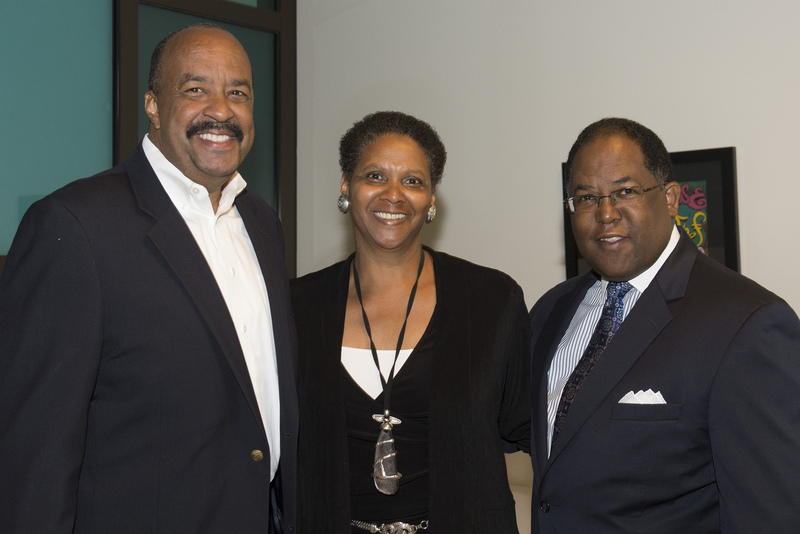 June 21 was a historic day for the National Association of Minority Contractors (NAMC). Gloria Shealey was sworn in as the first woman president in the 43-year history of the organization, and a new partnership between Emerald Cities and NAMC was formed. As a guest speaker at NAMCâ€™s National Conference closing dinner, ECC President Denise Fairchild recognized the partnership as an immediate manifestation of the conference theme: A New Direction, New Opportunities. ECC and NAMC pledged to work together in our key markets and highlighted the benefit of such a partnership in Portland, Oregon, where there has been a twelve-fold increase in minority contracting. NAMC Oregon Chapter President, Maurice Rahming, sits on EC Portland's Local Council, and NAMC Georgia Chapter President, Arthur Queen, sits on EC Atlanta's Local Council and the ECC National Board of Directors. ECC also used the occasion to publicly announce the LA Minority Contractors Green Building Training program, created to connect NAMC members to the growing opportunities in the energy sector. Having NAMCâ€™s voice on ECCâ€™s board is invaluable in crafting a new normal in the construction industry among business, labor and community interests. ECC Vice President for Investments Kevin Warner was featured as a panelist on Impact Investing - Scaling to Wider Markets at a recent gathering of major investors and advisors in New York City. The gathering, hosted by Clean Economy Development Center and Drinker Biddle & Reath, LLP, was the second such event since April at which Kevin was a featured speaker. ECC's triple-bottom-line mission was embraced by those attending providing evidence of strong demand for our type of investments in the growing mission-oriented capital marketplace. "If ECC can demonstrate and deliver a predictable and reliable pipeline of high-quality investments that feature strong energy efficiency, community engagement and social equity dividends as well as financial returns, there is a long and deep room of investors ready to act," he states. On May 31 EC Portland Local Director Casey Barnard presented coalition building and Community Benefits Agreements as tools to embed the high road approach into developing EcoDistricts. EcoDistricts are strategic in nature, collaborative in approach and practical in application. With them, urban development practitioners are creating the neighborhoods of the future - resilient, vibrant, resource-efficient and humane. Emerald Cities looks forward to partnering with EcoDistricts across the country.